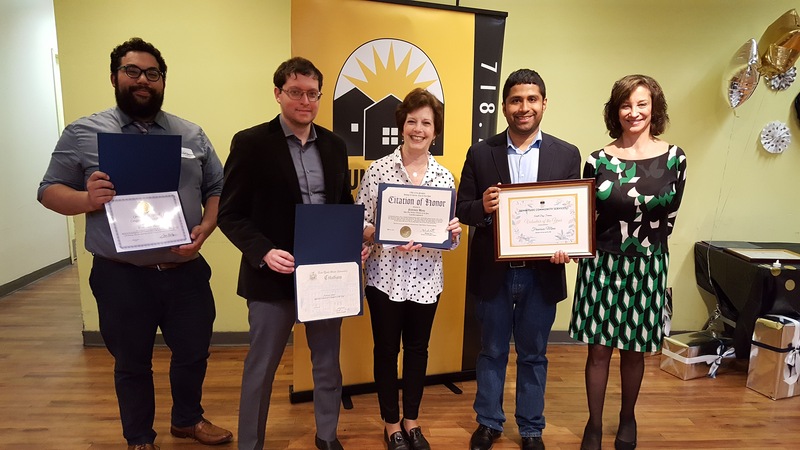 NY City Council Member Jimmy Van Bramer, New York State Senator Mike Gianaris, Assemblyman Brian Barnwell, and representatives from the offices of Congressman Joe Crowley and Assemblywoman Cathy Nolan were on hand to help honor Sunnyside Community Services’ volunteers at their annual celebration on April 26, 2018. 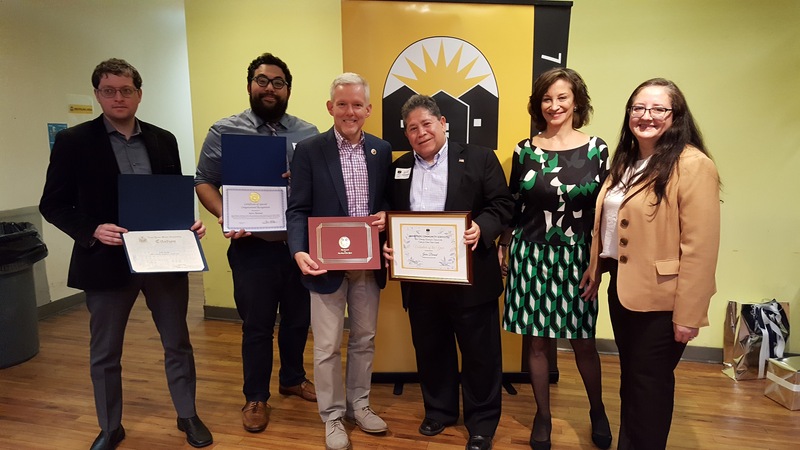 Among the hundreds of volunteers serving at SCS, Sunnyside Community Services recognizes several “Volunteers of the Year” for their exceptional service to the agency and the community it serves. After serving as a combat engineer and spending 25 years in management, Jairo Bernal decided to retire. But that didn’t mean slowing down. Jairo is a regular volunteer at the SCS Center for Active Older Adults, welcoming and assisting members at reception, and helping with onsite blood pressure screenings, which keeps members on top of their medical information between doctor visits. 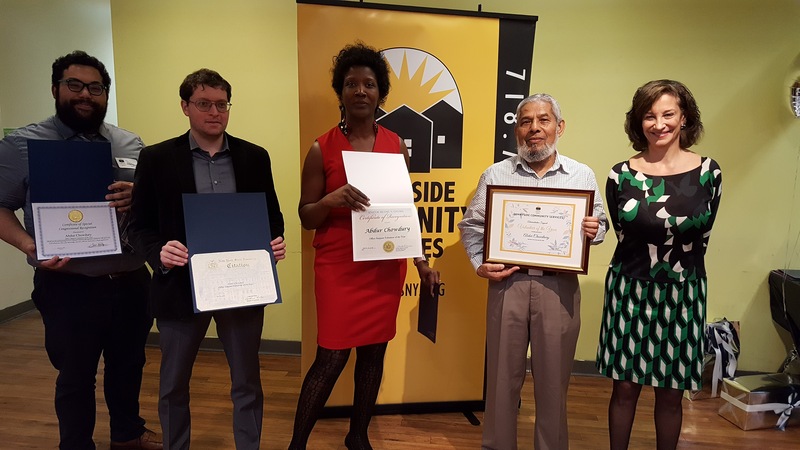 For his service, Bernal was recognized as the SCS Abe Vilensky Volunteer of the Year for Service to the Center for Active Older Adults. Francisco Mena volunteers in SCS’ Social Adult Day program for people with Alzheimer’s disease and other dementia. 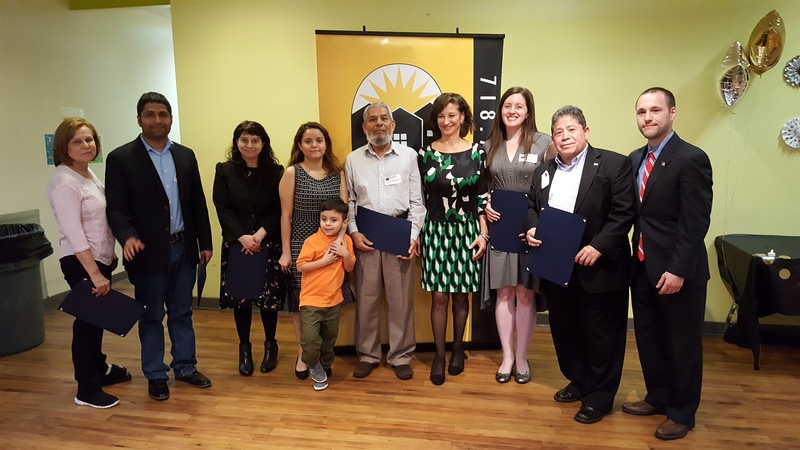 Francisco’s reliability, sensitivity to the special needs of the members, and his ability to provide Spanish translations for staff, families, and members helped him to win the SCS Adult Day Services Volunteer of the Year Award. Abdur Chowdhry is a passionate advocate about healthy and independent aging. He has volunteered more than 1,200 hours since joining SCS in late 2016. 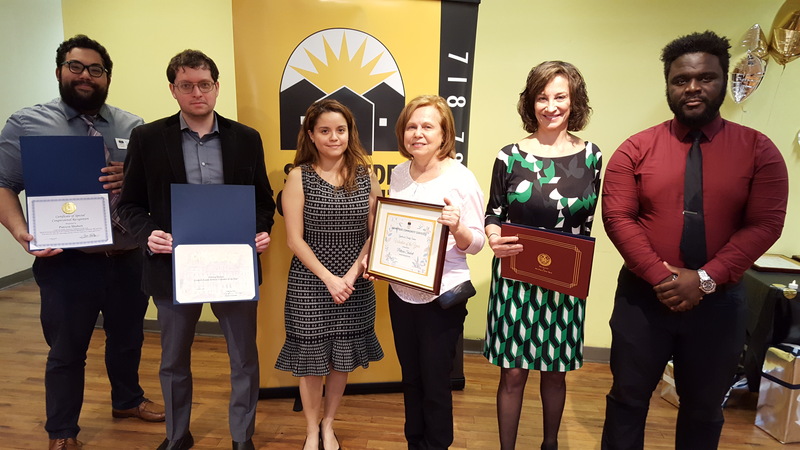 He jumps in to do whatever needs to be done, and still attends classes such as the SCS English as a Second Language class in his “free time.” For his dedication and energy, Abdur was awarded the SCS Administrative Support Volunteer of the Year Award. Patricia Shubert has been instrumental in supporting the unique intergenerational programs SCS offers to older adults and local youth. Shubert helps to organize events and leads the team of seniors in devising creative programming. She also finds time to help the SC pre-Kindergarten programs as well. For her service, Shubert was awarded the SCS Youth and Family Services Volunteer of the Year Award. Emily Vertosick has volunteered as a Friendly Visitor at SCS since 2014, visiting Alice, age 65, every week, and almost never missed day. In addition to providing companionship, she helps Alice with small chores around the house such as using the computer or reading mail. Emily also walks Akira, Alice’s retired service dog, allowing Alice to keep her at home. 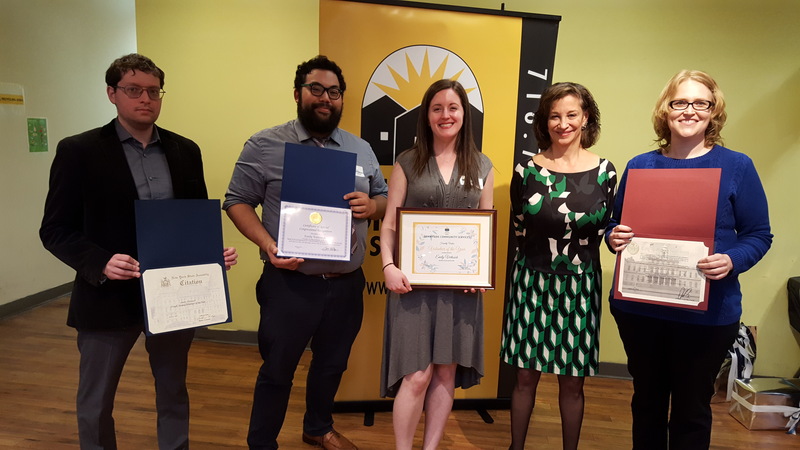 As an example of the beautiful friendships that can bloom in volunteer service, and for her commitment and dedication, Emily was awarded the SCS Friendly Visiting Volunteer of the Year. 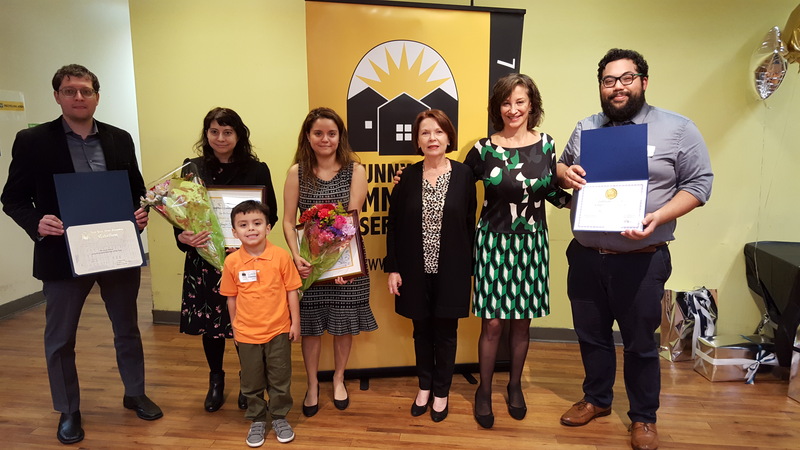 Since it was formed last year, Jennifer Silverman and Shyvonne Noboa have tirelessly co-chaired Sunnyside Community Services’ Advocacy Committee, determined to make a real difference in the community. For their focus on defending the rights of all New Yorkers, Jennifer and Shyvonne were awarded the first SCS Gert McDonald Advocate of the Year Award, named in memory and honor of Gert McDonald, a long-time SCS member and legendary local activist. Eileen Auld, Gert’s daughter, presented the award to Jennifer and Shyvonne, citing the Committee’s efforts in setting up voter registration drives, phone banks for urgent issues, participation at marches and rallies, and defending the rights of SCS’s diverse population and all New Yorkers. 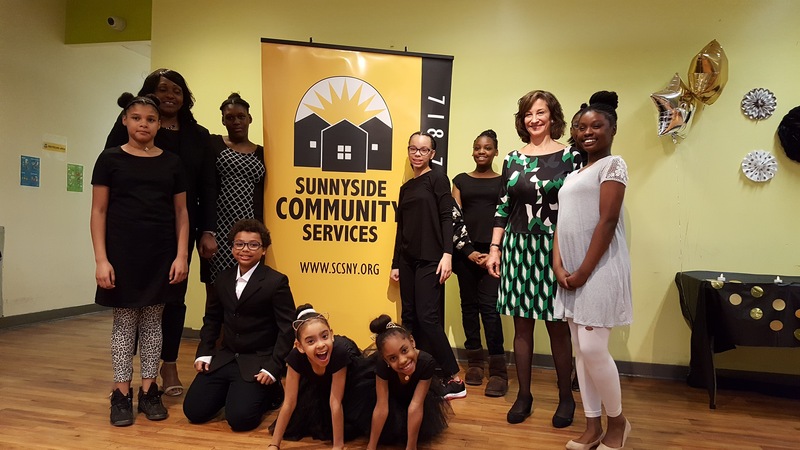 Sunnyside Community Services “lights up lives with programs diverse as the people it serves,” offering a wide range of programs and services for people of all ages. 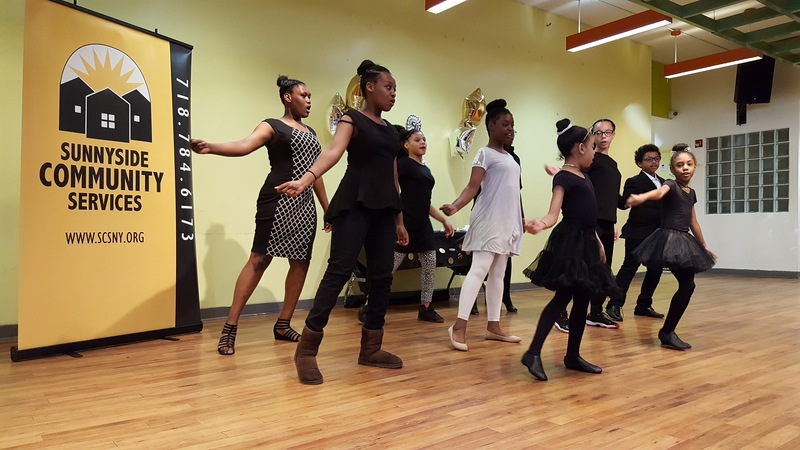 SCS is located at 43-31 39th Street, Sunnyside, NY 11104. To volunteer, contact Czarinna Andres, Director, Volunteer Services and Community Relations at Sunnyside Community Services at 718-784-6173, ext. 401, or email volunteering@scsny.org.